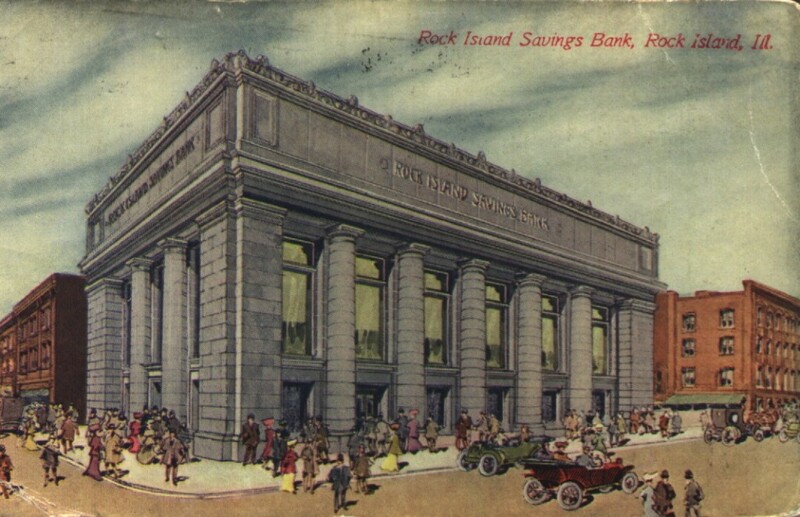 The Rock Island Savings Bank was brand new when this postcard was mailed in 1911—so new, in fact, that instead of using a photo as a basis for the card, a drawing of the bank was used. The rendering allowed the publisher to make the building appear much larger as well – if drawn correctly, the citizens thronging the sidewalk would be only about 4 ½ feet tall and the autos would have a wheelbase of about 6 feet. This was Rock Island’s homage to a Greek temple on the corner of 18th Street and 3rd Avenue, with two huge Doric columns facing west and five facing south. It was built at a cost of $100,000 in 1911, for the Rock Island Savings bank, which had been founded in 1890. The lot where the bank building stands was previously occupied by a home, which faced 3rd Avenue. After the home was torn down, two buildings were constructed on the lot – the bank and an adjacent smaller brick storefront on 18th Street, which contained the offices for the bank. That structure is not even depicted on this postcard. Although the bank was 32 feet tall – normally two or three stories– it actually contained only a single story with a soaring ceiling. Constructed of reinforced concrete, the outer walls were surfaced in smooth Bedford limestone. The windows were deeply recessed, framed by the columns, topped by an impressive carved cornice and deep frieze. The large windows ensured adequate natural light and probably ventilation as well. The interior was reportedly finished with the finest marble, bronze and mahogany. There were 75,000 pounds of steel in the fire- and burglarproof vault. Ladies were provided their own room and there was a general waiting room as well, thoughtfully equipped with a telephone and stationary. Early in the century, the Greek Parthenon was an often-used classical inspiration for banks, probably to convey the financial stability and longevity of the institution within. In small and large towns throughout the country, there frequently was such a classical columned building nestled among brick Italianate storefronts downtown. And where are these wonderful buildings now? Usually not banks anymore, they may be a beauty parlor, a gift shop, or real estate office, even though the old banking use is apparent. 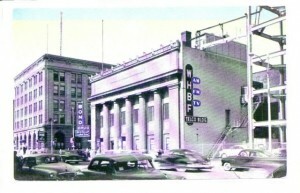 Or perhaps, as in Rock Island, the old bank is a television broadcast building that is no longer recognizable as a bank. During the Great Depression of the 1930s, the banking world changed. In 1932, the Rock Island Savings Bank merged with two other local banks – Central Trust & Savings and Manufacturer’s Trust & Savings – to form Rock Island Bank and Trust Company (later Firstar and now US Bank). As banking operations were consolidated\ in another bank building across 18th Street, the building on our postcard was vacated. It remained empty for many years, with only intermittent use by small businesses. 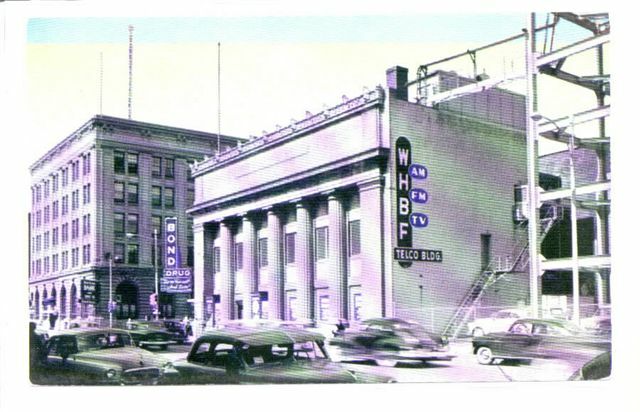 By 1950, the building had new owners and a new name as well: Telco Building, home of WHBF-TV. Interior remodelings added stairs and floors to create two more stories in the originally single story building. WHBF occupied the top two stories, while a drugstore was located on the street level. A 400-foot tower with an 86 foot antenna atop was also constructed in 1950. In 1957, more remodeling took place, with work reportedly of $150,000. In this project, the exterior was covered with granite, brick, and bright turquoise metal tiles, creating a look straight out of a 1950s TV program. More recently, the original bank and its adjacent building were covered in a stucco material, with shadowed panels evoking the original columns, which are still hidden underneath. Are the marble, bronze, and mahogany interiors still under the contemporary finishes? Likely they are not. But some original artifacts may still be in the community. A front page Argus story (August 6, 1998) featured a pair of massive bronze doors that are of a size suggesting main entry doors. Appropriate to our bank building, the doors show many classical motifs, from an ornate Greek key and egg-and-dart border to acanthus leaves framing three-dimensional eagles. Another pair of smaller and lighter bronze “French” doors may have functioned to ensure the ladies’ privacy from the main waiting room. Thus the Rock Island Savings Bank building has lived up to the original premise of stability and longevity in its own way. It endures, despite a completely different look and function. This article by Diane Oestreich is slightly modified from the original, which appeared in the Rock Island Argus and Moline Dispatch on June 3, 2001.